Fernando, was one of my absolute favorites at this summer's shows (2005). Fernando pranced in and was breathtaking with his charisma and stunning movements. He has the rare bloody shoulder mark on his right side; the myth says that horses that have this mark have been touched by Allah's hand. At the Scandinavian Open Show at Blommeröd he was placed second in his class, with 92,67 points, after another Monogramm son - Premier (with 93,33 points). Fernando was namned Reserve Champion Stallion after the above mentioned Premier, but still, Fernando definitely was my winner. He got the individual points 20-19-19 for arab type and 19-20-20 for movements. 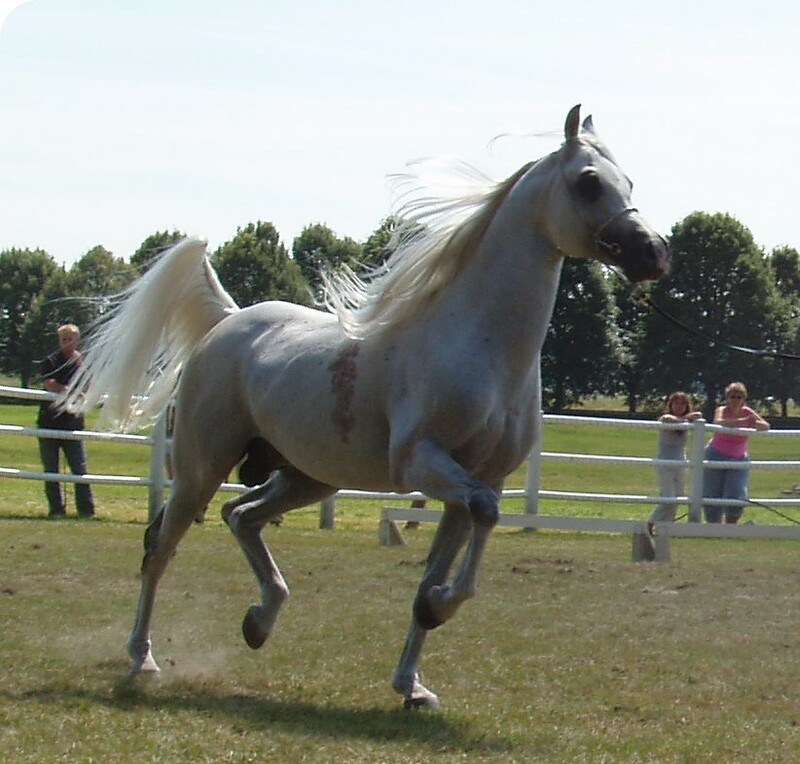 Fernando was used at stud in Poland, at Michalów in 1998 and 2002 and by private breeders 2001. Fernando's got 14 registered offspring in Poland, one of them is out of the fabulous Warszula (1983, by Palas) whom he was trusted to cover in 1999. Fernando raced on the track in Poland, but unfortunately I don't have his results. 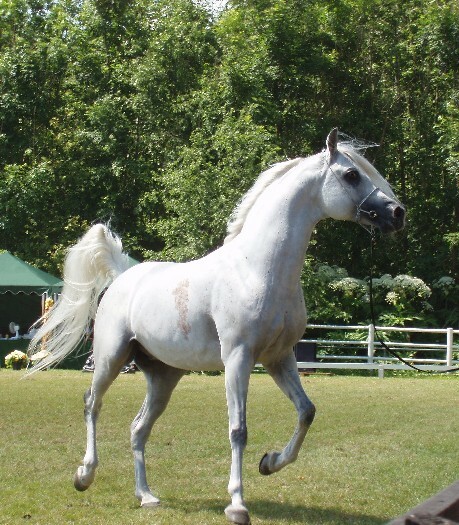 He is now owned by Turban Stud in Denmark, but is at stud in Germany in the fall 2005. Fernando's show results; 2005 Senior Champion, National Show in Denmark, 2005 Class winner at National Show in Denmark with gold medal and 91,5 points, 2005 Reserve Senior Champion Stallion at Scandinavian Open Show at Blommeröd, Sweden, Polish National Top Five Colt, Warszaw International Top Five Stallion. Fernando's sire is the super stallion Monogramm, who probably the most famous of Negatraz' sons. 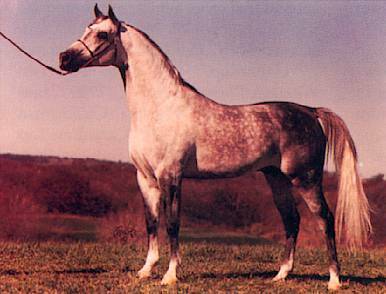 Monogramm was bred by Richard and Kay Patterson in 1985. He is a dynamic chestnut and and considered by many to be one of the most dynamic show horses of all time for his excellent type and extreme trot Monogramm has a long show record to be proud of, some titles are; United States Reserve National Champion Futurity Colt, United States Top Ten Stallion, Regional Champion Stallion, Scottsdale Top Ten Stallion, Pacific Slope Top Five Stallion and Champion Park Horse. Monogramm was on lease to Michalów Stud in Poland for two years. He has given Michalów a big number of world-class offspring, many of whom have dominated the European show scene for years. In 2004 3 out of 4 of the highest selling lots at the Polish Prestige were Monogramm daughters and in 2005, again a daughter of him was the highest selling lot. The Monogramm influence is spreading around the world through his get, with over 80 championships and counting in nearly 20 countries. Fernando is adding to that list. Fernando's dam, the pretty Frejlina (1983) is a Stakes winner and daughter of the wonderful Pepton. Frejlina is the dam of Figlanka (1995, by Monogramm) - Fernando's full sister who was sold at the 2003 Polish Prestige Sale to Brazil for the sum of € 105.000, Her daughter Ferri (1998, by Emigrant) was sold to the UK at the 2005 Pride of Poland Sale. Frejlina's son Fen (1991, by Gadir) is Polish Emargo Stakes Winner and Polish Skowronek Stakes Winner, the daughter Freja (1989, by Piechur) is Nordeutsche International Champion Mare. Fernando's maternal grandsire, Pepton (1977), was an excellent race horse in Poland, with the record 2/16 (11+4+0-1) - 11 wins between 1980-81! He won titels such as; Polish Race Horse of the Year, Polish Produce Stakes Winner, Criterium Stakes Winner, Kohelian I Stakes Winner, Sambor Stakes Winner, Skowronek Stakes Winner, Comet Stakes Winner, Bandos Stakes Winner, Czort Stakes Winner, Wielki Szlem Stakes Winner. 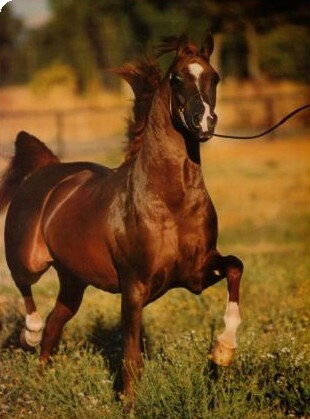 In addition to those breathtaking results Pepton was also the 1989 Polish National Senior Champion Stallion, 1983 & 1984 Polish National Reserve Senior Champion Stallion and All Nations Cup Class Winner. Pepton is also the sire of several Stakes, Oaks- and Criterium winners and Ecaho (1990) - 1995 Polish National Senior Champion Stallion, 1995 All Nations Cup Class Winner, 2005 US National Champion Top Ten Stallion.